I have two paintings that have been accepted into the juried 6×6 to 12×12 show at Falls Church Arts. The clever name means that all works need to be square and between the size of 6×6 inches to 12×12 inches. That makes it interesting because these are not sizes that I, nor most of the showing artists I learned at the opening, normally paint in. It means that we needed to paint specifically for this show. Up until now, I have not painted with a show in mind. When shows come up that I have an appropriate work for, I enter it. So, this was a completely different perspective. I knew the show was coming up and happened to be in a local art store and thought to buy some watercolor paper that was 6×6 and wood panels that were 6×6 and 12×12. That was on a Saturday afternoon. I came home and looked up the entry date, only to find that it was midnight Sunday – the very next day! Realizing that doing oils on the wood panels in time was out of the question, Sunday I set out to paint watercolors. I originally planned to paint three, but I got two pretty good ones and was running out of time, so I stopped. I got the entry in on time and both paintings were accepted. 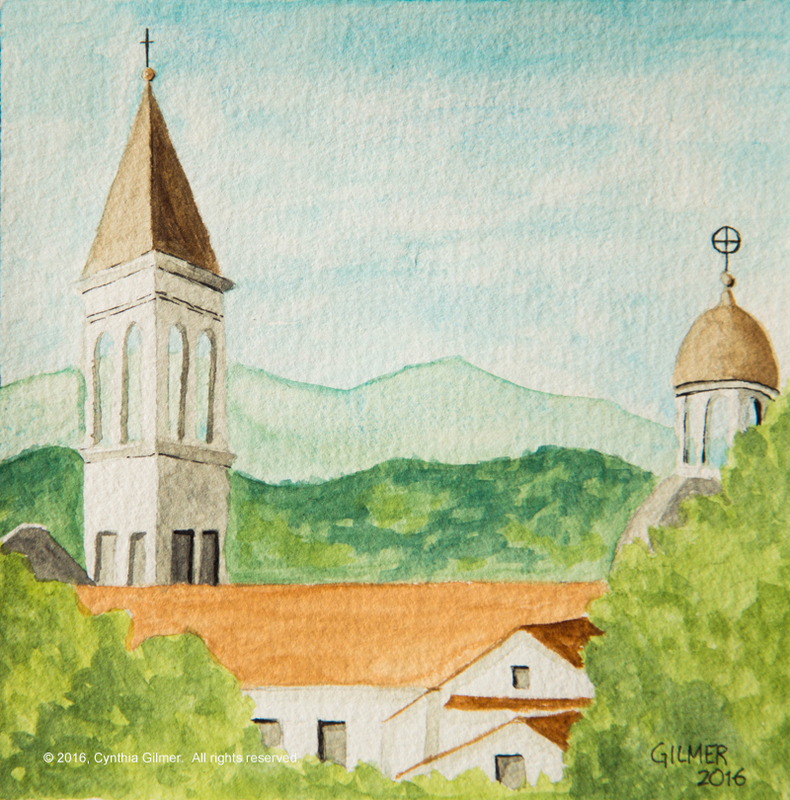 The first is a painting of the town of Spoleto from a photo I took on my recent trip to Italy. The second is a view from the golf course in Wintergreen. This was actually from a photo that I took in the early morning hours. The trees were actually dark silhouettes. I decided to recolor for autumn and it came out quite nice. Both paintings will be on display at Art Space (410 S. Maple Ave.
Falls Church, VA 22046) till December 3rd. 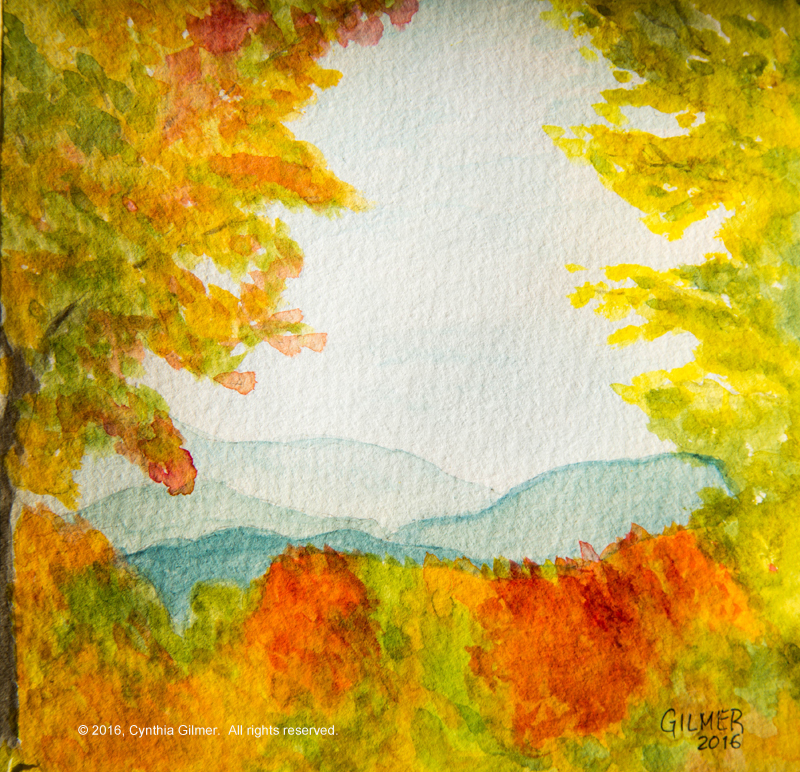 This entry was posted in Paintings, Shows, Watercolor by OpusPlus. Bookmark the permalink.